A traditional micro cache placed near the St Nicholas Church at West Looe. Dedicated to St. Nicholas, Bishop of Myra, the 4th Century Saint who is probably more famously known as Santa Claus, St. Nicholas Church, West Looe, was built sometime in the 13th or 14th centuries and has had a varied history, originally being part of the Parish of Talland. 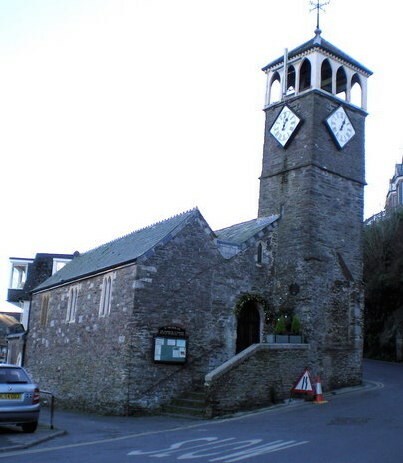 During the Commonwealth the church was desecrated and became the Guildhall of the borough of West Looe. However, during the restoration of the monarchy, in the reign of Charles II, it was again used for Divine Worship. Subsequently it reverted to secular use and was again used as the Guildhall and also as a prison, replete with a ‘scolding cage’ for nagging women!!. Eventually, in the 19th Century, the building was passed to the Church Commissioners and underwent numerous modifications and restorations to its interior and exterior. In 1978 the Church of St. Nicholas, West Looe, was united with the Parish of St. Martin’s, East Looe. The Millennium brought to fruition the reinstatement of a working clock in the clock tower. The original had been removed for repairs in the early 1900’s, but unfortunately was mistakenly sold for scrap some time afterwards! The whole building was rebuilt in 1862 and now belongs to the Parish of St. Martin (East Looe) with St. Nicholas. The church is open most of the time in daylight hours. Parking is sometimes available on the roadside near the church but in busy times the best place to park is the Mill Pool Car Park at N 50° 21.470 W 004° 27.580 which costs 70p for an hour - plenty enough time to find the cache. The South West Coast Path follows the footpath alongside the quayside on the southern side of Looe Harbour. Walk on past the church and follow the quayside path past all the small shops and the old fisherman's loft. The path goes past a significant lamp post!! The cache is a 35mm film container and is magnetically attached.